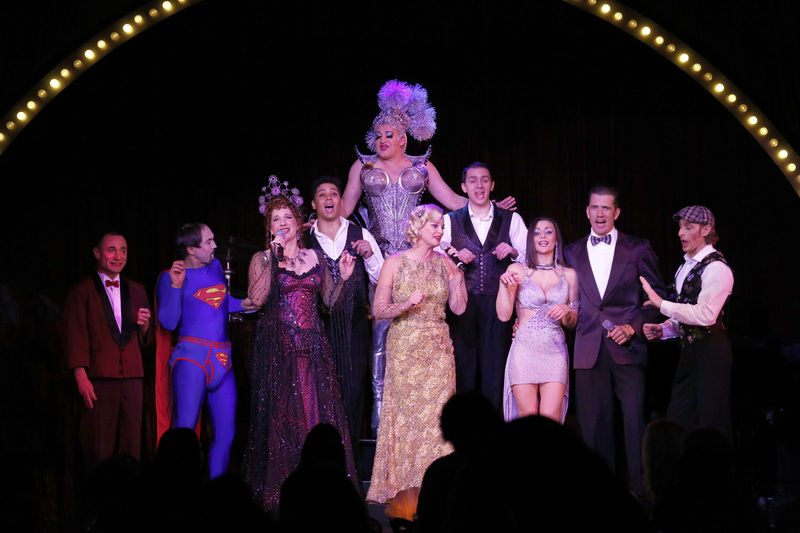 Full Cast of ‘On the Air’ at Teatro ZinZanni’s. 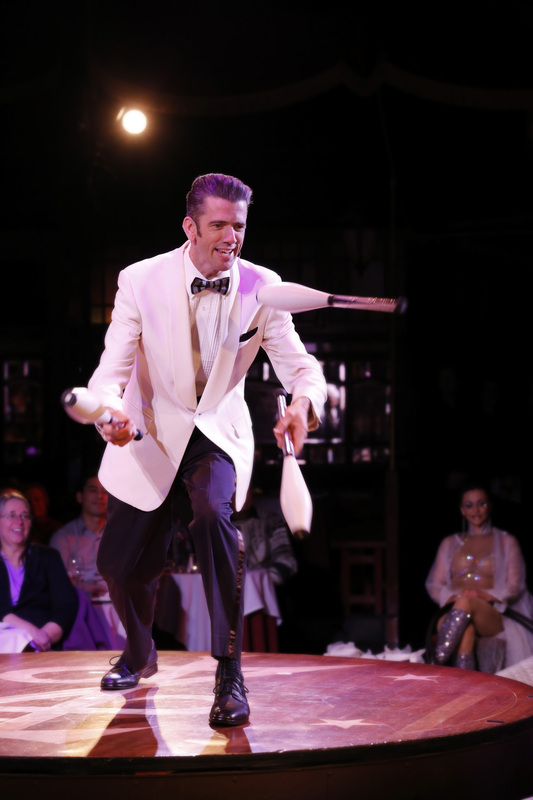 Joel Salom in ‘On the Air’ at Teatro ZinZanni’s. Les Petits Frères (Domitil Aillot, Gregory Marquet, and Mickael Bajazet) Teatro favorites, continue to delight audience with their vaudevillian style of slapstick humor, dance, acrobatics and their uncanny ability to tell a story without any words. The lowly bucket and mop man who just wanted to play his oboe for the crowd, captured the hearts of the audience and then blew everyone away at the end with his feats of strength and dexterity on the pole. 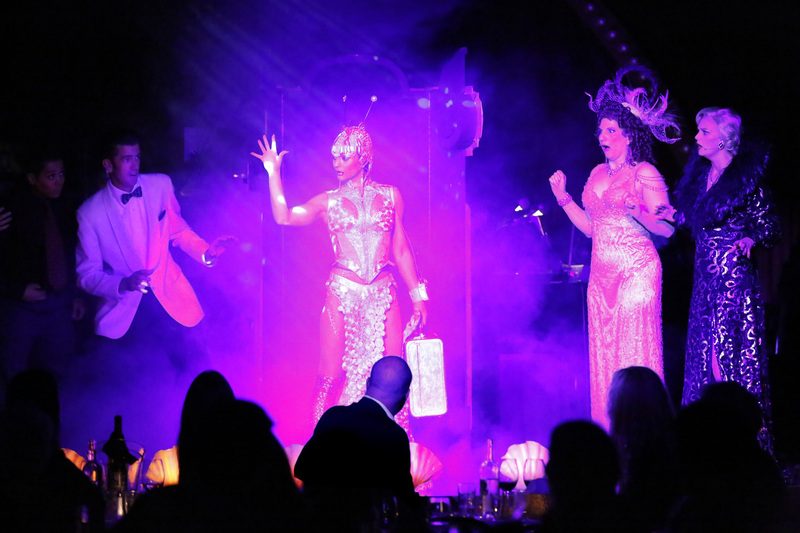 Together their fast paced comedic routines, tumbling and balancing acts were sharp and executed to perfection. (l-r) Joel Salom, Vita Radionova, Juliana Rambaldi & Anki Albertsson. Similarly, the captivating Vita Radionova playing the naïve alien contortionist silenced all side conversations with her entrancing hula-hoop performance; then thrilled us with her sensual contortions and demonstrations of strength and balance. Radionova a Ukrainian graduate from the legendary Circus School of Kiev, stunned the crowd with her series of amazing one-handed balancing act. The Collins Brothers (Matthias Fischer and Collin Eschenburg) clowned their way throughout the show, akin to something out of a Jerry Lewis, Harold Lloyd or 3 Stooges performance but then caught everyone off-guard with their slick, humorous and talented trapeze work. No one saw that coming and the image of Matthias Fischer hanging from the trapeze in his Superman undies, after Collin Eschenburg pulled the ladder out from under him was priceless. Kevin Kent in ‘On the Air’ at Teatro ZinZanni’s. The host for the evening, Joel Salom was the gifted glue which linked all the acts together. His natural charisma, extraordinary juggling skills and friendly banter quickly endeared himself to the audience. His juggling performances began with the routine, but quickly charted new ground including a unique juggling music mixing act where each time he touched one of the balls to electronic contacts on his arms, a different audio clip from the production would get triggered. The classic, take of your jacket while continuing to juggle was another audience favorite, where he even engaged a member of the audience to unbutton his jacket, while continuing to juggle pins. The songstresses of the evening, Anki Albertsson and Juliana Rambaldi each enchanted with their individual style of singing and supplemented Joel in carrying the production from vignette to vignette. 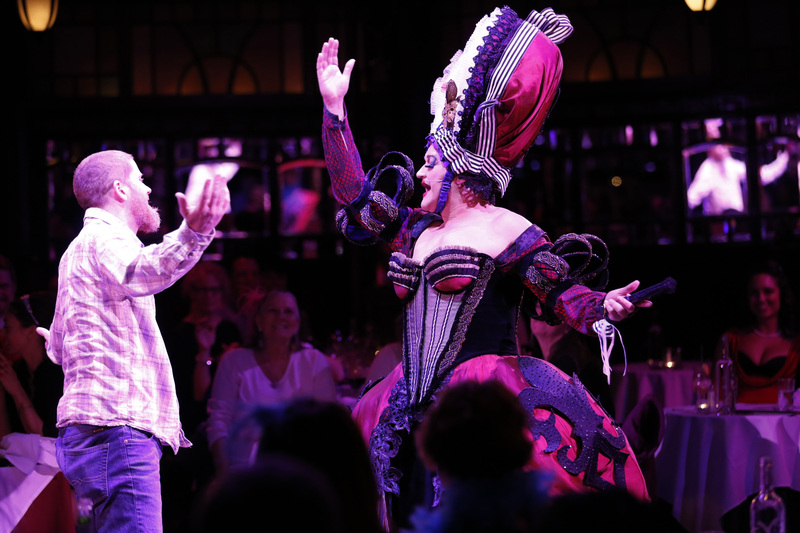 Albertson got the audience singing along with old favorites like Abba’s S.O.S., while opera diva Rambaldi soared, showing off her operatic prowess.